Anyone who asks why victims of sexual harassment and/or assault “didn’t say anything sooner” can go sit on a tack, and then be threatened with personal and professional ruin if they tell anyone about the tack lodged in their posterior. But as far as media coverage goes, here’s an interesting development in the ongoing fallout from last Thursday’s New York Times story about now-former Weinstein Co. head Harvey Weinstein: Namely, allegations have now emerged that the NYT was planning to run a story on Weinstein’s sexual misconduct back in 2004, but pulled it under pressure from Hollywood A-listers. That’s what The Wrap founder Sharon Waxman claims in a piece on her own site called, “‘Harvey Weinstein’s Media Enablers’? 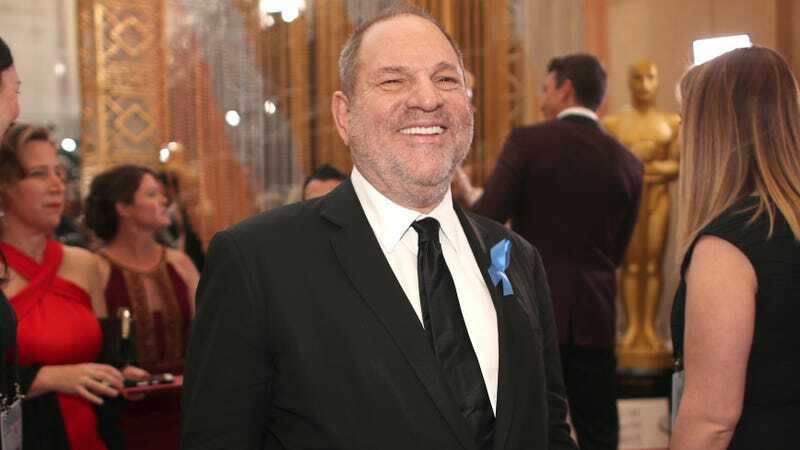 The New York Times Is One Of Them.” In it, Waxman praises Jodi Kantor and Megan Twohey, the investigative reporters who wrote last week’s NYT piece, but balks at media columnist Jim Rutenberg’s op-ed entitled, “Harvey Weinstein’s Media Enablers,” which ran on Saturday. Waxman goes on to claim that in 2004, she wrote a story about an Italian Miramax executive who allegedly pulled down a handsome salary simply to serve as an enabler of Weinstein’s sexual misconduct in Europe. She also says she interviewed a woman who had settled with Weinstein after an “unwanted sexual encounter;” “she was terrified to speak because of her non-disclosure agreement, but at least we had evidence of a pay-off,” Waxman writes. So what happened to this story, which Waxman says the NYT “gave [her the green light]” to write? It ended up being stripped of any references to sexual misconduct, and ran as a dry industry story about a fired Miramax executive. The reason, according to Waxman, is even more incendiary: She claims that “intense pressure from Weinstein, which included having Matt Damon and Russell Crowe call me directly to vouch for Lombardo and unknown discussions well above my head,” killed the story. “I was told at the time that Weinstein had visited the newsroom in person to make his displeasure known,” she writes. And indeed, while a few actors and directors—people like Lena Dunham, Amber Tamblyn, Jessica Chastain, Seth Rogen, Kevin Smith, Judd Apatow, Mark Ruffalo, Meryl Streep, Judi Dench, Glenn Close, and Kate Winslet, along with Rose McGowan, who’s been vocally calling for her peers to speak up—have spoken out about the allegations, overall the silence from Hollywood has been notable—notable enough for a New York Times column about it, ironically enough. As for Damon and Crowe, they did not respond to Vulture’s request for comment on the allegations in The Wrap.